The 2016 Purdue Master Gardener State Conference was held June 16-18, 2016 in West Lafayette, IN! 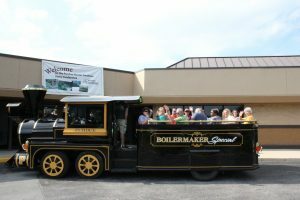 The Master Gardener Association of Tippecanoe County, Purdue Extension, Tippecanoe County and Purdue Master Gardener State Office hosted over 200 Purdue Master Gardeners and guests in Boiler Country! Elizabeth Hartley and Jolaine Roberts, Co-chairs for the conference along with Karen Mitchell, Extension Educator, Tippecanoe County and John Orick, Purdue Master Gardener State Coordinator served as the core planning team for the conference! Thank you for all your hard work to make this year’s conference a huge success! Congratulations to the following Purdue Master Gardener Search for Excellence Award Winners who received recognition on Friday, June 17, 2016. In 2013 a series of raised beds were constructed at the Clark County Fairgrounds by Sunnyside Master Gardeners to exhibit both conventional and organic vegetable gardening techniques to the general public. Plant specimens include annual and perennial varieties, as well as heirloom and hybrid cultivars of vegetables, herbs, and flowers. The beds were constructed in order to educate the public on conventional and organic gardening techniques while introducing new, heirloom or unique varieties of garden plants and to inspire the public by ideas, plants, and techniques that can be incorporated into a home garden. In March 2015, Fair Board President Ellen Wilson-Pruitt invited Morgan County Master Gardeners (MCMG) to plan and develop a Demonstration Garden at the Morgan County Fairgrounds. MCMG would be responsible for planning, planting, labeling and maintaining the gardens while fairgrounds personnel would provide materials and labor for the construction. At the request of the Fair Board, the theme for the first year would be “Heirloom Plants” in recognition of the upcoming Indiana Bicentennial. Goals for the project included educating individuals who visited the fairgrounds about heirloom plants and good gardening practices; encouraging school groups to visit thus sparking interest in young children; introducing the public to varieties with which they might be unfamiliar; educate youth about where vegetables come from during Farmer’s Day; providing opportunities for other collaborations such as supporting the Chop Challenge competition at the County Fair by providing herbs and produce to be used in the competition; and enhancing the attractiveness of the fairgrounds. The fairgrounds are used extensively by the public year-round, so the garden received significant exposure. In 2010, plans were implemented to restore a natural plant ecosystem to a portion of the Monroe County Courthouse Square. Purdue Extension Master Gardener volunteers, MC-IRIS members, the Monroe County Storm water Environmental Education team, and others concerned with the environment came together to implement a plan to install a native garden on the NE corner of the Monroe County courthouse grounds. Using extensive research from many different sources about the benefits of native planting, from pollinators to water use, the entire area was revamped, the watering system was removed, as were invasive and non-native plants. Non-invasive plants now provide color, habitat, and food sources for birds, bees, butterflies and other pollinators all season long. Water usage has dropped by an incredible 300,000 gallons during the summer months. Working in partnership with a member of the Monroe County Storm Water Environmental Education team, and the Monroe county Master Gardener association, the formation of a brochure commenced explaining the benefits of native landscaping and sustainable ecosystems. There is a growing awareness nationally and locally of how food gets to the table and the resources needed to get it to the table, toward planting and eating locally-raised and organic foods, and toward sustainability in general. Glendale Branch Manager Melissa Wooton and Master Gardener JoAnn Klooz planned the IPL Seed Library, which allowed members of the community access to a variety of plant and flower seeds that they could grow in their own gardens. At the end of the plant cycle, seeds could be harvested and returned to the library for future use. The Seed Library was overseen by Master Gardeners, who preserved the integrity of the collection and offered instruction to the community on preparing, growing and harvesting seeds. In a larger sense, the IPL Seed Library helped to create new thoughts and ideas regarding stewardship and sustainability of food & plant resources in the community. The Liberty Christian Garden Club, formed in 2008, is coordinated by Madison County Master Gardener volunteers, Janet Poore and Sharon Shear. In 2015, an outdoor reading room was created for all students and teachers to participate in and enjoy. Also, kids club afterschool programs. Teachers and staff can use area for reading and discussing books. This has encouraged kids to use their imagination and creativity. In the outdoor Reading Room students sit on logs while they listen to the current program, lesson, or book being read. The Garden club uses it for programs where Master Gardeners taught about types of trees; how to plant and take care of trees, and about varieties of grasses and sunflowers. Students love being outside versus being inside. Teachers do too! They get fresh air and enjoy learning about nature at the same time. Congratulations to all of these hard working Purdue Master Gardeners!